Before your first session, you will be asked to complete a waiver. This waiver will include a physical readiness questionnaire, which will allow us to have a better understanding of your physical condition and if there are any specific concerns that may prevent you from taking part in whole body cryotherapy. You will be provided with slippers, socks, gloves and a robe. 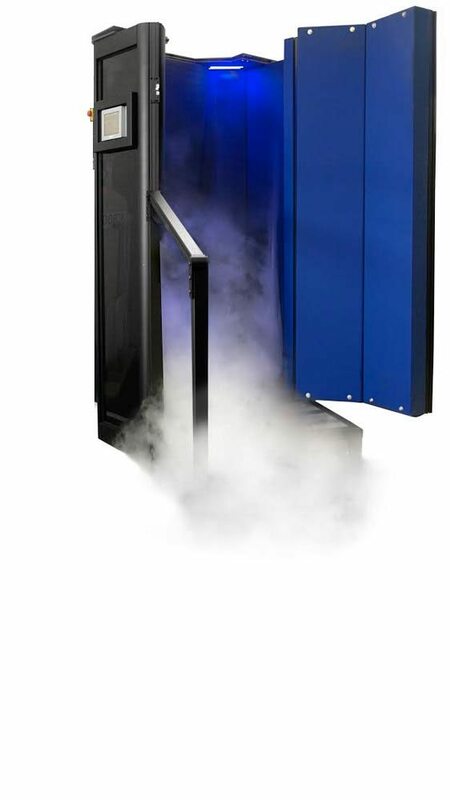 Once you enter the cryotherapy chamber, you will remove the robe and hand it to the technician and your session will commence. For your first session, you will be limited to two minutes in the cryochamber; however, you can ask to stop the session before the two minutes are up. At no point in time will you be left alone. You will be able to speak with your technician, and the technician will ensure that you are comfortable at all times. The temperature inside the chamber will be dropped to approximately -230 degrees Fahrenheit, and it will reach this temperature rapidly. While that temperature may seem scary, it is not dangerous or painful. And again, if you are uncomfortable, you can ask to stop the session at any time. Once the session is complete, the technician will prop the door open a bit to allow the cold air to exit. You will be handed your robe and you will head back to the changing room, where you will dress. Most people report that they warm up almost as soon as the session is completed; however, it is completely normal to feel cold to the touch for a little while. What you will mostly notice is a surge in energy. You will also notice that any pain or stiffness that you felt prior to the session will diminish. Additionally, you will feel a huge boost in your overall well-being. Whole body cryotherapy provides wonderful benefits. To learn more about the process and these benefits, contact Body Beautiful today! We are located near all points of interest in Centerport, including the illustrious Vanderbilt Planetarium. Complete all necessary information on the medical waiver form. Your medical history will be discussed with you before your cryotherapy session. Your blood pressure will be checked. Your questions or concerns about your treatment will be discussed. Men will remove all clothing except underwear. Women can choose to wear a non-underwire bra and underwear or may remove all clothing. All jewelry and any other metal on your body must be removed. All clients must be 100% dry. We will provide towels and hairdryers if needed. A robe, socks, and footwear will be provided for your cryotherapy session. We recommend using our exercise bike to accelerate the bodies re-heating process. You will regain circulation and increase your heart rate as well as your metabolism. Since cryotherapy minimizes inflammation and starts the detoxification process, you may experience mild flu-like symptoms one to two days after your treatment. This is normal and is an indication that your body is releasing toxins and inflammation. Drink lots of water to continue and aid the detoxification process . You will also experience a better and deeper sleep the night of your cryotherapy session along with increased agility and a reduction in pain. Your endorphins will kick in and your mood will be great!